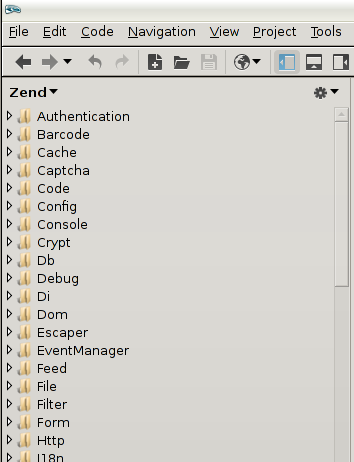 In Komodo I can make a folder root as you can see on the screenshots. Is there a similar feature in PhpStorm or what's a convenient workflow to achieve the same? I'm not familiar with Komodo. What this feature does (what are you trying to achieve)? 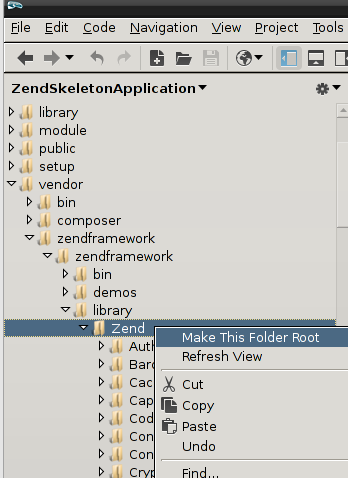 With 'Make this folder root' one can navigate into a directory and this directory shows up as the root element in the tree. Higher levels are simply not displayed which gives me a cleaner view. This is especially helpful when I need to work on a lower level for a longer time. The order of the screenshots should be the other way around. On the second picture you see the menu and on the first after making a directory the root element. "Settings | Scopes" -- create custom scope that would include only required files/folders. Switch to a required scope in Project View panel (instead of default "Project" which shows all project files). Andriy, thank you very much. Finally I find the scopes more handy than komodo's make this root.